We made this dessert when I was in Chicago visiting my family. We were shopping at Whole Foods Market and asked the produce manager what his favorite fruit was that day. 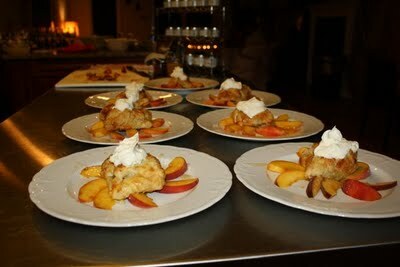 He said, “Local Illinois Peaches.” So that is what we bought and how this dessert came to be. Initially we were going to grill or sauté the peaches in butter with sugar, but they tasted so delightful as is, we decided to leave them as nature intended. What shall we serve to complement these beauties? Last month I made a Baked Brie in Fillo with Preserves, that became the inspiration here. Tangy whipped crème fraîche would provide the perfect balance to the sweet fruit. 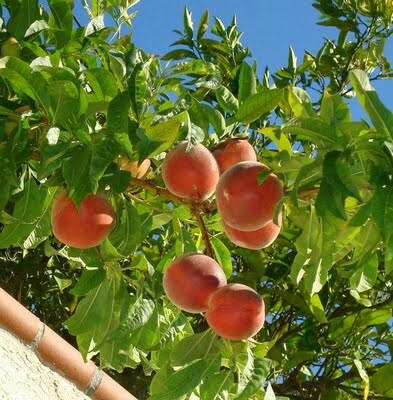 The photo above is of my neighbor’s peach tree here in Los Angeles. They told me to help myself. YAY! More peachy desserts are on the way! And a big thank you to my generous neighbors! 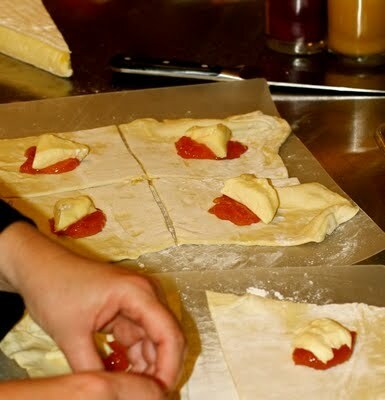 Cut puff pastry sheets into squares. Fill each square with a generous spoonful of peach jam and a piece of brie. Fold the corners together. Brush the pastry with melted butter and sprinkle with sugar. Bake until puffed and golden brown. Slice the peaches and arrange on the plates. 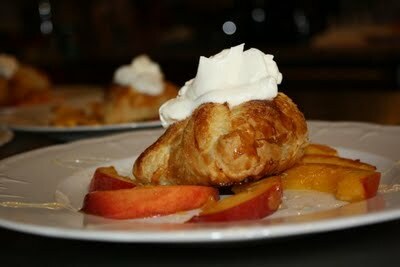 Place warm puff pastry in the center, drizzle with honey then top with whipped crème fraîche. A Splendid and Easy Peachy Dessert!